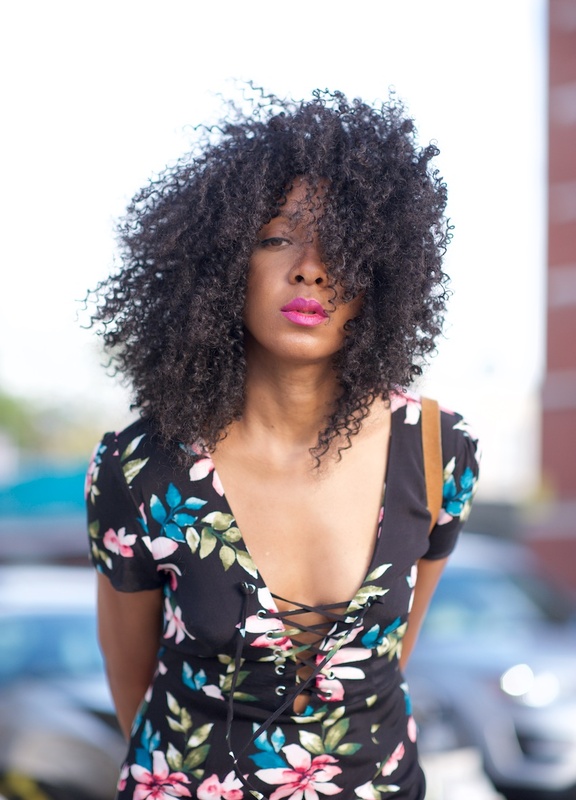 Enter fashion bloggers, where we often turn to for fresh outfit ideas. Lucy Williams wore a foolproof summer ensemble with a white peasant blouse, light wash vintage jeans, and ankle wrap sandals. 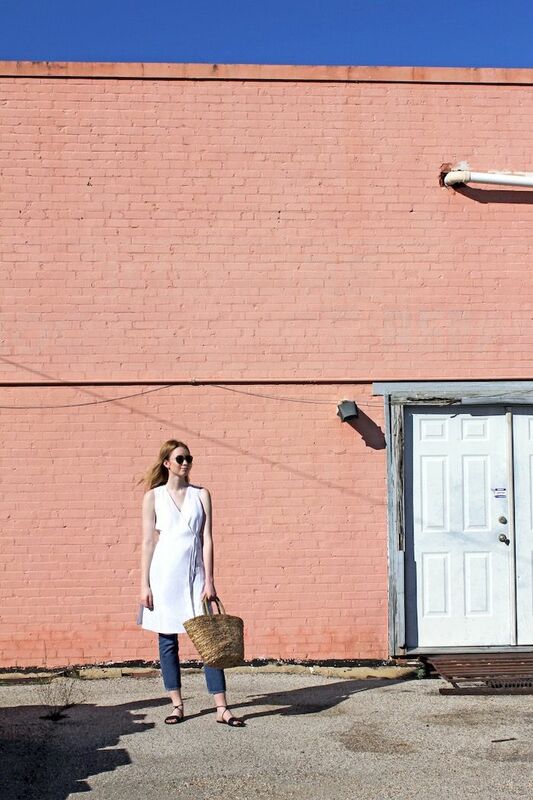 And of course, no warm weather outfit is complete without the season’s favorite accessory: a straw bag. Sienna Miller was spotted in a comfy yet incredibly stylish linen dress look that we can’t wait to recreate. This makes for an easy, breezy outfit to stroll around in all summer. Sandals are a dime a dozen; flat, chunky and strappy. They’re a summer necessity. But they don’t have to be boring. With the abundance of embellished sandals to choose from this season, you could have a different Pair for every day of the week. From fringed to Pom Pom clad, here are the best of the best. Denim cut-offs are a classic summer item. Besides a bikini and sandals, it’s a must have for everyday life during the heated seasons. 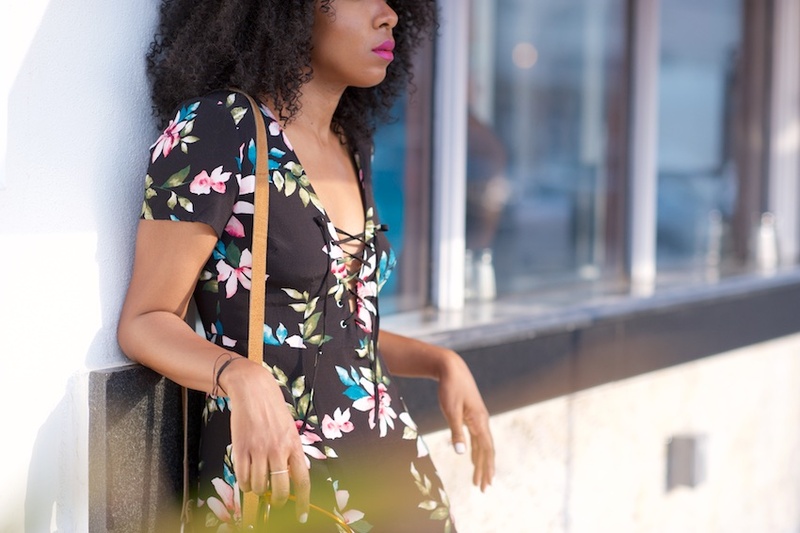 This blogger offered us a cool and laid-back way to style hers. 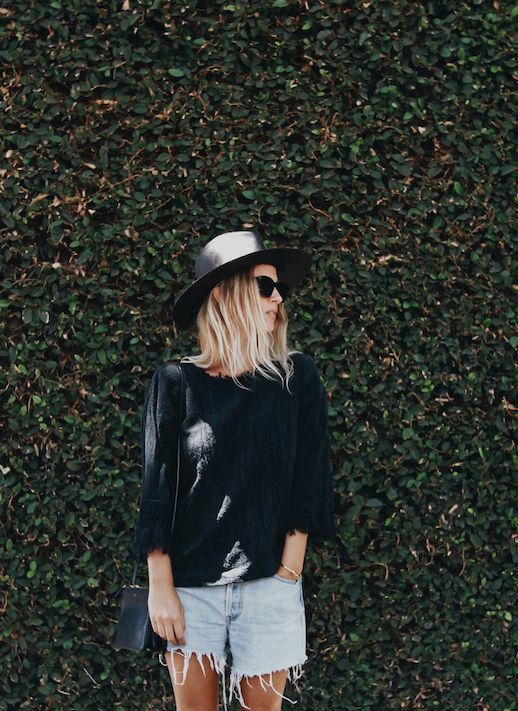 She opted for a black hat, black frayed top, vintage Levi shorts, and strappy black sandals. We’re loving this look. 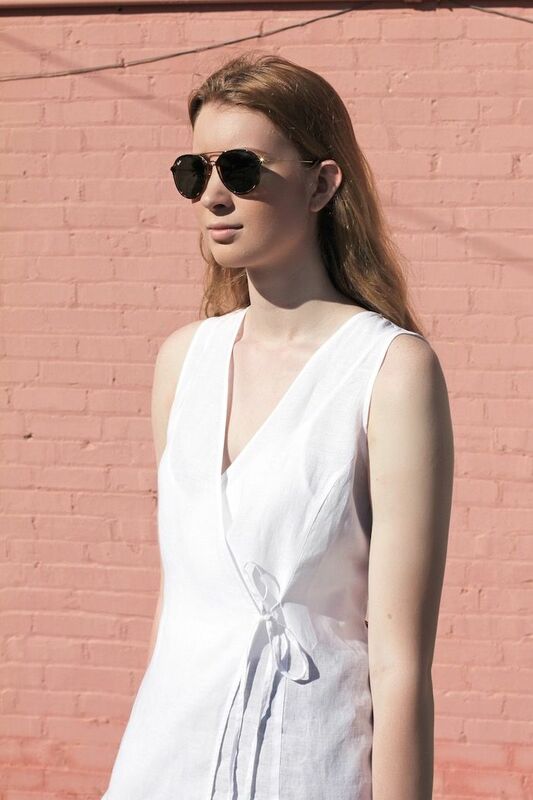 One of the best fabrics for spring and summer dressing is hands down white linenâ€”Itâ€™s a light, crisp weave thatâ€™s incredibly chic. For that reason, Iâ€™ve got my eyes on this sleeveless organic linen wrap top from the EILEEN FISHER collection at Saks Fifth Avenue. Go for a relaxed look with a pair of classic jeans and flat sandals, or dress it up with skinny black pants or culottes and mule heels. Best part is, this piece will keep you feeling comfortable and cool as the temperature starts to rise. Shop this top, plus more picks below. I’m a shoe addict. Â I was going to say shoe lover but that’s dancing around the truth. Â I’ve amassed a shoe shelf display of them that’s constantly seeing new and old rotating in and out on a bi-weekly basis. Having said all that, with all the temptations of new spring shoes, there is one style that I still think looks the best of them all; the classic espadrille. 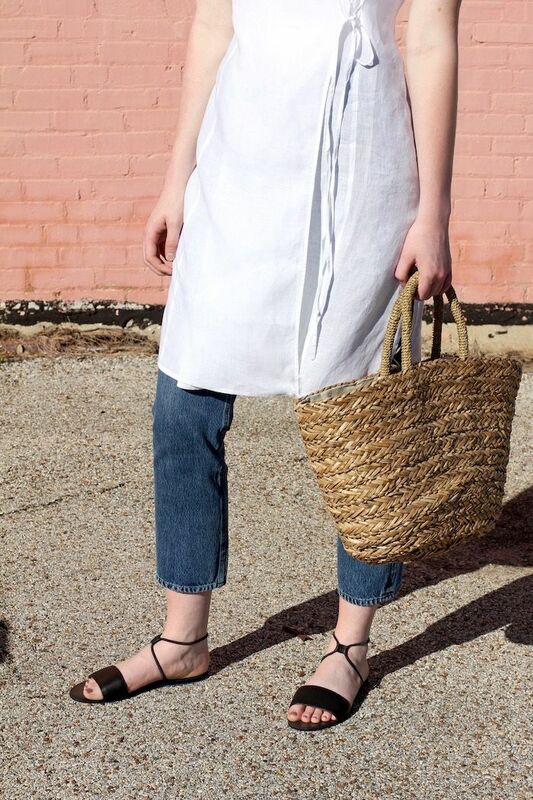 Â Of course now there are tons of variations: platformed, embellished, peep toe, leatherÂ you name it but to me, the best one is STILL the classic canvas wedge espadrille. Â They don’t break the bank and they work whether you’re on a two week holiday orÂ shoppingÂ in theÂ city. Â In London, I used to wear them every summer without fail and then one day, I got distracted by other shoes (don’t we all?) but I never stopped thinking about them. The shoe lover addict side of me wants to show you another round ofÂ the latest spring shoes, but for once trends be damned, I want to wear my humble espadrille again. Question: Â Do you still wear them? Sorry but theÂ photos from St. Lucia will inevitably start trickling in and this isÂ the first taken last week at Pigeon Island. Â I know it’s bloody freezing in New York so hearing me bleating about mosquito bites will probably fall on deaf ears. This is that Burning Torch dress that you saw in the summer (with short hair). Â It’s the only food baby parachute like dress that doubles as a beach cover up without being too much like either. MoreÂ from my week onÂ Instagram and Snapchat (karenbritchick). Sometimes you come across a street style look you just can’t get out of your head, and for good reason. This babe was photographed at Milan Fashion Week wearing an incredible red, ruffled blouse, light-wash boyfriend jeans, and braided black sandals. She topped off the look with an embroidered box bag and a sleek hairdo. Have you noticed that the best dresses are the most forgiving? They skim and feel like you’ve had them for years from day one. Case in point with this one that arrived yesterday (unboxing on snapchat: Karenbritchick). Jessica Alba stepped out in the dress of the season over the weekend. It was white (perfect for summer) It was off-the-shoulder (Obviously, we’re into it) And it was in a waist-cinching, linen fabric. The best part? The all-too-flattering midi length that we adore so much. To complete the look, she wore it with a pair of slides and shiny, gold disk earrings. Got to confess: I miss wearing long dresses. It’s the one piece worn since day one on Where Did U Get That; remember this witchy black dress and this floor sweeping one from years ago?? I found a couple more last week starting with the above black number. It’s too hot for skinny jeans or anything remotely clingy, so fling on and go dresses it is. Speaking of fling on and go, long and short hair has always appealed so now I’m playing around with both (it’s a wig). Also, speaking of hair, don’t forget the huge hair product giveaway on my Instagram which ends this Monday 13th. See the selfie boomerang photo for details @Karenbritchick. I’m picking a winner at the end of the day on Instagram! We’re all concerned about how to cuff, which we should be, but really it’s about which cuff goes with which shoe. You want to cuff your jeans so you can showcase your shoes but make sure you’ve got the right cuff. There’s an art to it. Just look at this array of recently cuffed celebs. Read the full post The Right Cuff: Top Shoe and Jeans-to-Cuff Pairings which appeared first on Snob Essentials.